Ashtanga Yoga is a beautiful and dynamic practice, incorporating posture (Asana), movement (Vinyassa) and concentration (Dristi), all syncopated to a strong and long breathing technique (Ujaya & Bandha). Mysore-style is the traditional method of practicing Ashtanga Yoga, whereby each student progresses through a precise sequence of postures as a self-practice. Instruction is one-on-one within the group setting; each student works independently at his/her own individual pace, and is assisted individually by the teacher, who gives verbal instruction & physical adjustments, thereby developing a safe and fulfilling practice, appropriate to each students’ level. Therefore classes are suitable for all - including complete beginners to yoga. Zero flexibility is zero problem! Mysore-style is typically practiced in the early morning, before breakfast on an empty stomach. Students are free to start their practice at any time convenient to them during the class hours. Typically practice takes 60 – 90 minutes. Those who are interested to learn yoga in this traditional, comprehensive and scientific way and are prepared to commit to between three and six days practice per week will find the practice very rewarding and potentially life changing. Benefits are numerous; including increased physical, mental and emotional flexibility, strength, stamina and balance. The movement and breathing process produces intense internal heat and a profuse, purifying sweat that detoxifies muscles and organs and improves circulation. Over time, alignment and injury issues can be helped and a lighter and leaner body developed. As a self-practice system, Mysore-style also imparts to the practitioner a greater sense of self-reliance and self-confidence. Often practice leads one towards a healthier and more moderate lifestyle and a calmer mind. Ashtanga Yoga has experienced a complete renaissance in recent years, and is now very widely practiced in the West and East alike. It is famously the yoga of choice for many of the uber-fit icons of the modern age including Madonna, Angelina Jolie, Gweneth Paltrow, Christy Turlington, Sting, Willem Dafoe and Coldplay singer Chris Martin. The system is credited as the inspiration for many of the intuitive modern dynamic yoga systems, including all forms of Vinyasa Yoga, Dynamic Yoga, Power Yoga, Flow Yoga etc. 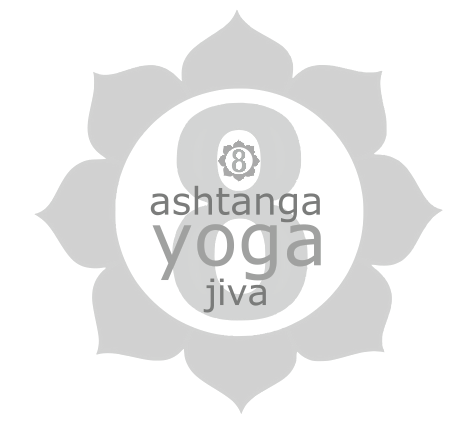 Ashtanga Yoga, practiced in its correct sequential order, gradually leads the practitioner to rediscovering his or her fullest potential on all levels of human consciousness; physical, psychological, and spiritual. Through this practice of correct breathing (Ujjayi Pranayama), postures (asanas), and gazing point (driste), we gain control of the senses and a deep awareness of our selves. By maintaining this discipline with regularity and devotion, one acquires steadiness of body and mind. BREATH:The continuity of deep, even breathing cannot be overemphasized in the Ashtanga Yoga system. When breath feeds action,　and action feeds posture, each movement becomes gentle, precise, and　perfectly steady. This information has been generously provided with the approval of Sri K.Pattabhi Jois. Please honor its authenticity and distribute only in unaltered form. Until quite recently Ashtanga Yoga was taught in Mysore, Southern India, by the late Sri K. Pattabhi Jois. 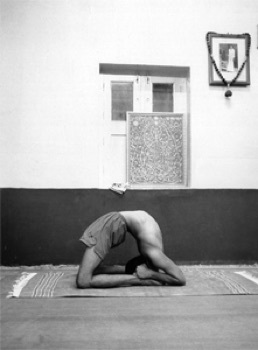 He taught it for 70 years, and was therefore perhaps the most experienced yoga teacher of our times. Known to his followers as Guruji, Jois learnt it over a period of 25 years, from his guru, Sri T. Krishnamacharya. A veil of mysticism surrounds how it was that the practice of Ashtanga Yoga came to be rediscovered. Legend has it that it is an ancient system - at least 2500 years old - that was taught by Vamana Rishi in a text called the Yoga Korunta. 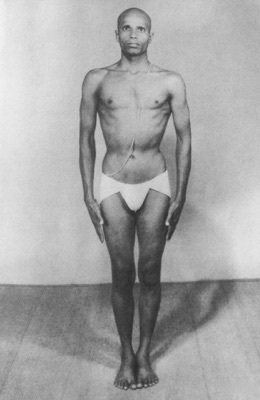 It is said that later, about 100 years ago, Rama Mohan Brachmachari passed the system on to Sri T. Krishnamacharya. 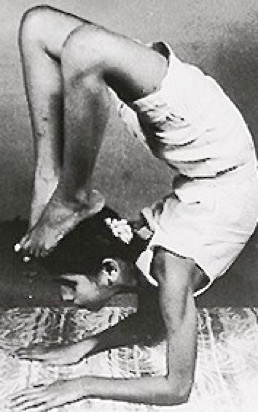 Krishnamacharya in turn taught it to the young Pattabhi Jois in the 1920’s. The two men worked together on the practice for about 25 years. Later Krishnamachrya taught the system to B.K.S Iyengar, and later still to his son T. K. V. Desikachar. 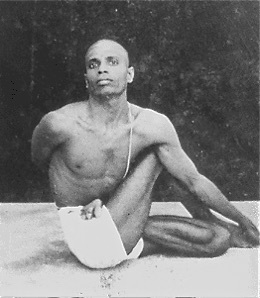 Only Pattabhi Jois chose to desist from any personal reinterpretation of the system, and to this day it is generally agreed that Ashtanga Yoga deviates only in minor details from the original teachings of Krishnamacharya. 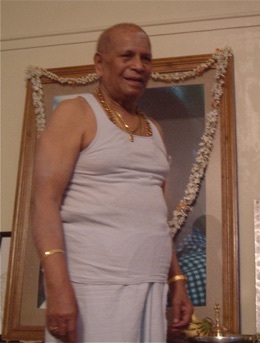 Pattabhi Jois patiently taught his Gurus system for 50 years at his humble shala in Mysore, The Ashtanga Yoga Research Institute, before the first wave of Western practitioners started appearing there in the 1970’s. In 2002, Pattabhi Jois and his family finally moved on from the small 12 person shala to a grander venue that can, and usually does, accommodate 50 plus practitioners at a time. 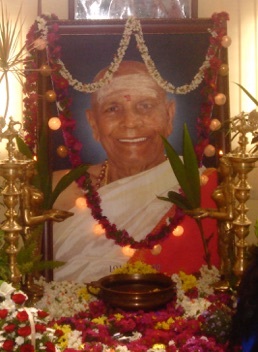 Sri K. Pattabhi Jois died on the 18th of May, 2009 at the age of 93. Pattabhi Jois’ grandson R. Sharath Jois is now the inheritor and the most respected authority of the Ashtanga Yoga system. He was for many years Gurujis primary student, receiving private study early every morning and is the only person in the World who practices all six series of Ashtanga Yoga. 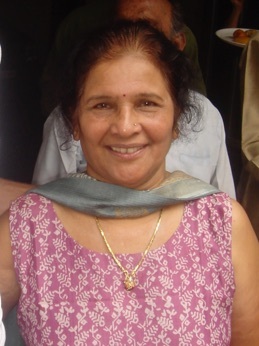 In addition during those years, Sharath assisted Guruji in class every day. 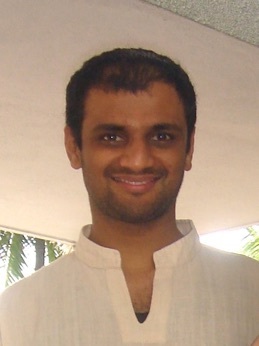 Sharath now teaches for much of the year at the shala in Mysore, now renamed The Shri K. Pattabhi Jois Ashtanga Yoga Institute.